SVRA, the Sportscar Vintage Racing Association, has upwards of 400 participants spanning ten groups of race cars with vehicles from around the world. Most of the cars are period-correct, racing in the same configuration as originally raced many years ago. The cars are arranged into groups based on a number of different criteria and offer spectators a wide variety of racing to enjoy. The list includes vintage stock cars, production-base GT racers, open-wheeled Formula cars, and more. Most events feature 10 groups of racers competing in 30 minute Sprint Series races. There are often several featured MotorCheck Enduro Series races plus several special events, which would place either a marque or type of car in the spot light. Recently, the SVRA took to Mid-Ohio's 2.4-mile, 15-turn racing circuit as they battled a rain-soaked weekend in quest for the checkered flag. The Austin Healey Sprite and MG Midget were the features and highlights of many of the weekend activities, including a 50th Anniversary race on-track and the 10 Annual British Car Showdown. There were two Enduros with the first held on Friday and the second on Sunday. John Deford led the way in his well-tuned Porsche 914/6 and would maintain that position until the last corner of the last lap. After seventy-five minutes of racing, first and second place were separated by only 00.114 seconds. The Porsche 914/6 driven by Ron Zitza and Gregg Frey took the coveted top spot. Third place went to John Schrecker in a Porsche 356SC Roadster. Howard Katz and Travis Engen led the pack out of the pits for the Second Enduro of the weekend. Katz drove a TOJ 205C while Engen piloted a Lola T97/20. There was much shuffling between all positions throughout the race, but when the checkered flag fell, Engen was in front followed by Katz. Third position went to Michael Snowdon in a GRD 272. The Formula B feature race was scheduled for Saturday, but was postponed to the following day due to the weather. When racing began, it was a fierce battle for position between the Brabham BT29s. Dave Handy's BT29 led from the start, followed by Shelby Mershon's BT21 and Joe Blacker's BT29. By mid-race, there were a total of five Brabhams in the top five spots. As the race came to a close, the Brabham's held their position, with Joe Blacker out in front. A mere 00.127 later, Handy crossed the line. So far, Sunday's races were shaping up to be very entertaining. Next on the agenda was the Formula Atlantic Feature. Ian Bass in a March 79B quickly established a strong lead. Robert Blain sat comfortably in second in a March 762. Third place was another March, driven by David Kane. On the second lap, Kyle Kaulback in a Lotus 69 negotiated his car into the third spot. There would be no more top position changes and this is the order they would finish. The Austin Healey Sprite/MG Midget Feature race occurred mid-day on Sunday, in-between the Group Races. Just prior to the start, the rain began leaving conditions less-than ideal. Just after the race began, more rain fell. Many of the competitors went to the pits and did not return. Those who stayed out battled the elements more than each other. When the race ended, Scott Schhmidt in an Austin Healey Sprite MK3 was in the lead, followed by Chris Gross in an Austin Healey, and the MG Midget driven by Richard Rzepkowski in third. The first Optima Battery Sprint of the day was Group 10 featuring some more powerful cars of the day. From the start, it was three Porsches that led the way. Mark Walriven drove his Chevy Monza from fifth place into the top spot after several hard-fought laps. Second place would go to Stan Crawford in a Porsche 911 RSR. Third went to Brian Lockwood driving a Porsche 964 C2 Cup. Group 1 was led by a pair of Mini's. James Fuerstenberg's Morris Cooper S was chased by Greg Wold driving an Austin Cooper S and last year's Group One Champion, Harry Gentry in a Austin Cooper S. It would take Gentry a few laps, but he skillfully drove past the Mini's and into the lead. By lap four, Fuerstenberg was forced to retire, leaving Wold in second and Terry Milnes' Austin Cooper-S in third. Though it appeared positions would change, this was the order to the finish. Group 2, featuring Formula Cars, had a similar story as in the Formula B Feature, and saw a trio of Brabhams on the podium. Ian Baas, driving a Titan MK6 was able to break the group up part-way through the race, but on the final lap, Joel Quadracci driving a Brabham BT29 overtook him for third. Phil Harris in a Brabham BT23C took second and first went to Marc Giroux in a Brabham BT29. Group 7 took to the track next, featuring Can-Am cars, Sports 2000 racers, and SCCA A & B Sports Racers. Robert Blain in a Chevron B31/36 led the group on the first couple of laps. He was overtaken by Joel Finn in a Chevron B23. Behind them was a slew of S2000's. After a few laps, Blain retired from the race, Finn was still in the lead, and David Clubine in his Swift DB2 had assumed the second position. Jack Ruscilli was in third but soon retired from the race. Things got interesting on lap eight, as the rain let-loose, spectators went running, and most of the cars headed for the pits. On the final lap of the race, the Dave/Noah Arude Swift DB2 was in the lead. In second was another Swift DB2 driven by David Clubine. Finn finished third. Group 7 was followed by the rain-soaked Austin Healey Sprite/MG Midget Feature race. Next was the Group 3 Optima Battery Sprint. Rain was still an issue but most Group 3 competitors took the track. The pack was led by a pair of Porsche 356's followed by a Yenko Stinger. When the race came to a close, the Lotus Super 7 driven by Bob Colaizzi was in the lead. 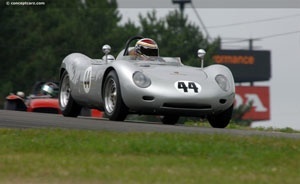 Second went to the Porsche 356B driven by Vic Skirmants. The big-bore production sports cars of Group 6 were up next. The Corvettes did battle for the podium spots throughout most of the race. On the final lap, the rain began and shuffling occured throughout the ranks. The top three spots were secured by Corvettes, with Peter Klutt in the lead, followed by Chris Hines and then Tommy Thompson. Fourth went to a Camaro and fifth to a Sunbeam Tiger. Groups 4 & 5 were next. The rain was still heavy and with the combined group, the field was very large. Sitting in front was the Jaguar XK150 driven by Max Heilman who would finish in the same position he began. Second went to Travis Engen driving a Lotus 23. Richard Milburn took third in his Jaguar XKE. The final race of the day was Group 8 featuring series produced sports cars and sedans in production prior to 1979. By now, the rain was slowing but still an issue. A pair of Alfa Romeo GTV's took the top two spots followed by a BMW 2002. Erik Wood took first followed by Robert/Heidi Mocas and Tim Murray. At times, the rain was very intense making it a difficult weekend for spectators and racers. Nevertheless, the race groups were populated and the racing was often very intense. The hills, turns, and fast straight stretches at Mid-Ohio provided many opportunities to enjoy the vintage machines.